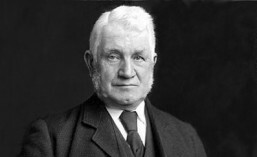 Sir William Arrol died at his home in Seafield, Ayr on 20th February 1913 at the age of 74 years. He had been suffering for about 5 weeks from flu which had developed into pneumonia and from which he was making a slow recovery. During this time, he developed an abscess in his lower bowel which required surgery, but in his weakened condition the operation was too much for his body to cope with and he died the following day. 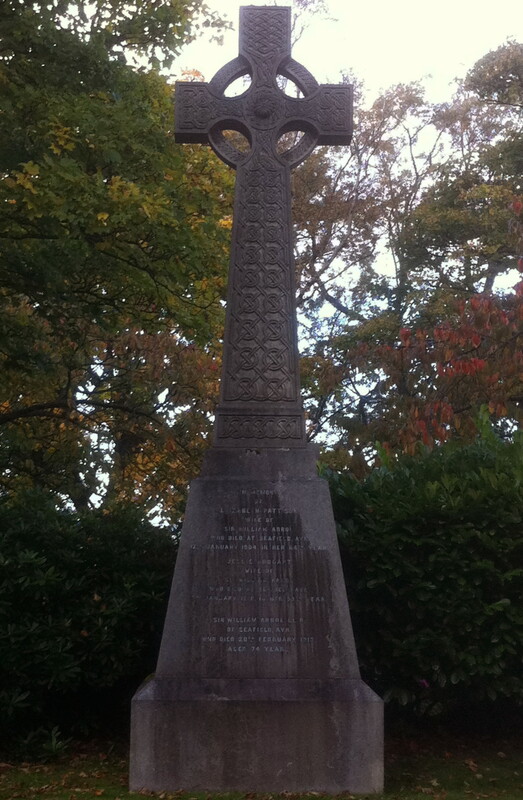 Sir William was buried at Woodside Cemetery in Paisley on the afternoon of 24th February 1913. The day of the funeral began with a small private service at Seafield House for relatives, workers on the Seafield Estate and a few close friends. The coffin was carried to Ayr Station with a cortege of 3 carriages, laiden with floral wreaths, passing through streets of Ayr which were lined with onlookers. At the station it was transferred onto a train for it’s journey to Paisley and from Gilmour Street Station the coffin and chief mourners were carried to the cemetery at Woodside by another cortege of carriages. Behind these walked other mourners and hundreds of employees of the Dalmarnock Iron Works who had been brought by a special train from Glasgow. The funeral procession would have made an impressive sight as it passed through the town centre and up the High Street, past thousands of people who had gathered to pay their last respects. Flags had been set at half mast at Ferguslie Thread Mills, of which Sir William had been a Director, and at the Royal Alexandra Infirmary. Pall-bearers included Lady Elsie Arrol (Sir William’s wife), John Hunter (nephew and a Director of Sir William Arrol & Co. Ltd), Thomas Arrol (nephew), Thomas Arrol jnr. (nephew), Sir Thomas Mason (of building firm Morrison & Mason, and Liberal supporter), David Harris (Sir William’s first apprentice), Mr Patrick Robertson (brother-in-law), James McLardie (nephew), and Andrew Biggart (a Director of Sir William Arrol & Co. Ltd). Sir William was buried with his first two wives, Elizabeth Pattison and Jessie Hodgart and their grave is marked by an impressive celtic cross carved in granite with knotwork panels. When he died Sir William’s estate was worth £317,749 which in today’s money would be the equivalent of over £20million. Although he had no children of his own, Sir William was very much a family man and left bequests in his will not only to his immediate family but also to his extended family. He also left many public bequests including: Glasgow Royal Infirmary, Glasgow Western Infirmary, Ayr Infirmary, Glasgow Eye Infirmary, The Higginbotham Sick Poor Nursing Association incorporated Glasgow Old Man’s Friendly Society and Old Woman’s Home, and The University of Glasgow. In addition to his monetary legacy, Sir William Arrol left behind an impressive catalogue of iron structures which he had built and many of which still stand today for the nation to enjoy. Also, many of the inventions and techniques introduced by Sir William continue to be used in engineering today. He left his firm, Sir William Arrol & Company Limited, in good hands and it continued to add to this legacy of iron structures until the Dalmarnock Works closed in 1987.